In July 2010, in an article in the American Spectator, “America’s Ruling Class — And the Perils of Revolution,” Boston University Professor Emeritus Angelo M. Codevilla made the trenchant observation that the real divide in America is not so much between liberals and conservatives as between the bipartisan political ruling class vs. the American people. Whereas the majority of the American people are religious (Christians) and patriotic, the bipartisan “regime class” — stripped of their lip-service rhetoric — are irreligious, arrogant and contemptuous of the American people, and love neither America nor her people. Read an excerpt of Codevilla’s long article here. 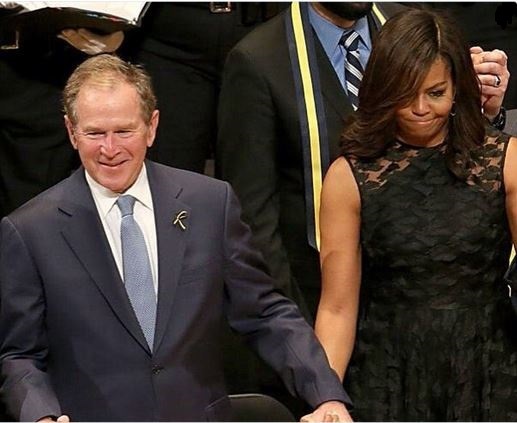 We saw another display of that bipartisan ruling class at RINO Sen. John McCain’s funeral on September 1, when former president George W. Bush, 72, behaving like an impish schoolboy, snuck a piece of candy to a beaming Michelle “Big Mike” Obama, as their respective spouses, Barack and Laura, smiled indulgently. 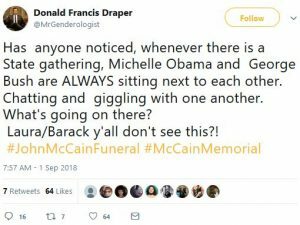 Who knew that a funeral is an occasion for jovial frivolity? 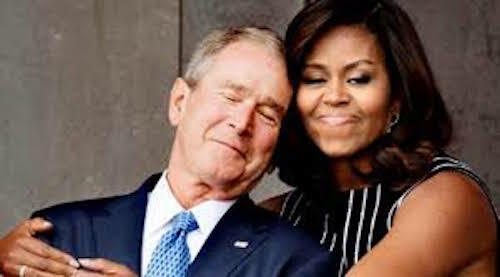 And what was Big Mike doing with his hands in the laps of Barack and George W., as all three and Laura Bush grin as if they’re in on some private joke? 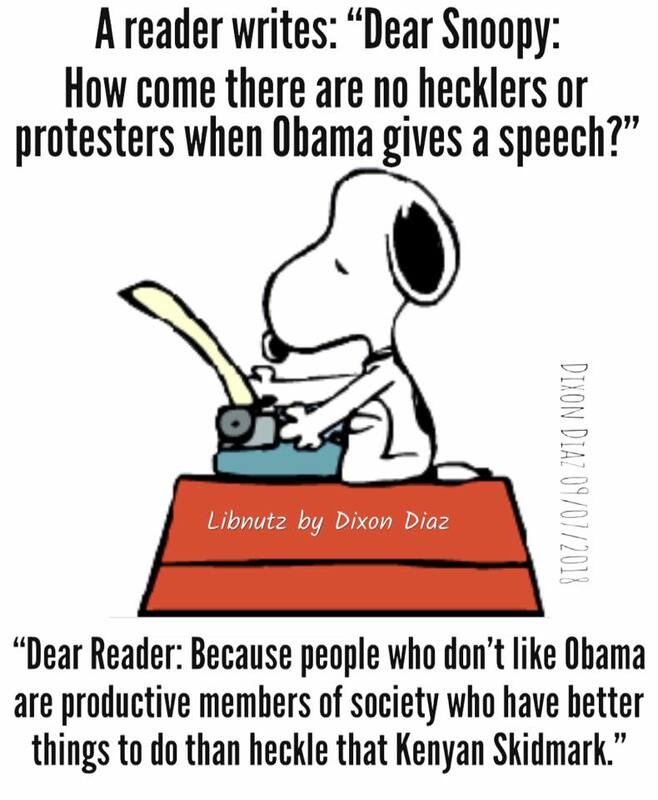 What was so amusing at a memorial service for slain police officers? Dubya must have finally paid off his Progressive Penance by opposing Trump’s nomination. Because it wasn’t so long ago that he was a racist, war criminal and literally Hitler. 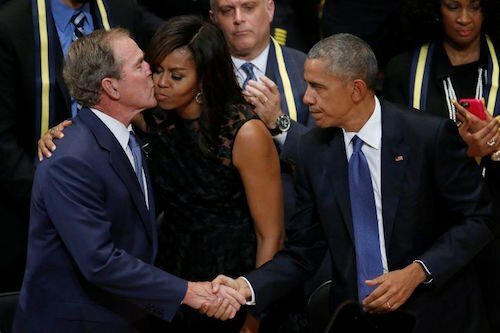 For eight long years, the Obamas didn’t have a single nice thing to say about Bush. And now they’re best buds? He must not be the world’s most hated racist anymore. Maybe it had something to do with Bush having joined the #Resistance. George W.’s coziness with Michelle O. has not gone unnoticed. Ole George W. must have a thing for swinging nuts. This entry was posted in Donald Trump, George W. Bush, global elite, Liberals/Democrats/Left, Michelle Obama, Obama, RINO, The Powers That Be, United States, US Presidents and tagged America's bipartisan ruling class, Angelo M. Codevilla, George W. Bush chummy with Michelle Obama, John McCain funeral, Michelle Obama is a man. Bookmark the permalink. Bush has always been an establishment globalist. Look how he and his family treated and are still treating Donald Trump. Hey, looks like Georgie is moving to the other side, and I mean the “other side” hummmmm. As “black and white” anything is possible in this day and age. 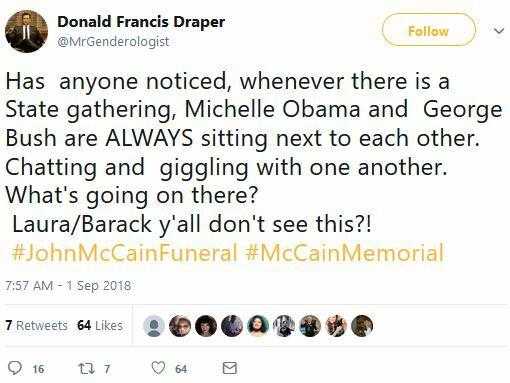 WHO WAS AT THE MCCAIN FUNERAL WITH BILL? Birdies of a feather, globalist perverts stick together. Yeah, Dirty Dubya was probably passing her the room arrangements for a menage à trois. Anyone who wants to know what Bush 43 is all about, can read my last major essay published on the internet, “The ghost of George Carver is haunting Bush 43”. The footnotes indexed at the end of it will give you leads on just who these people are and connections they have to one another. Mrs. 43 can only laugh. Wasn’t there hints that Georgie boy had a thing for Condoliza Rice when he was President?